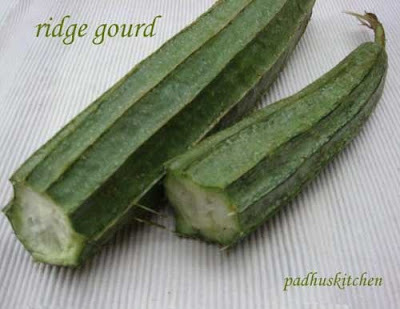 Wondering if one can make tuvaiyal from ridge gourd skin. My grandmother used to make this tuvaiyal/thogayal. Not only it is tasty but it is also rich in fibre. It is found that including fibre in your diet prevents constipation and may lower the risk for heart diseases and some cancers. This thol/skin thuvaiyal goes well with hot steamed rice with a dash of ghee or sesame seed oil. 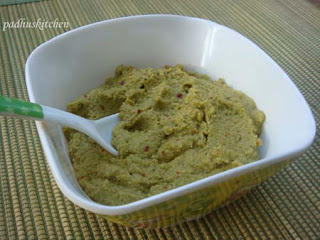 I used the flesh of ridge gourd for preparing turai dal and the skin for preparing this thogayal. Ridge gourd is known as Turai or Turiya in Hindi.Today we will learn how to make ridge gourd thuvaiyal following this easy recipe. Wash ridge gourd well, peel the skin and chop it into small pieces.You can use the flesh for preparing kootu. Heat a tsp of oil, add mustard seeds, when it splutters, add urad dal, pepper, tur dal, red chillies and fry until dal turns golden brown. Then add the tamarind piece and saute for just a few seconds. Keep it aside. Heat 2 tsp of oil and fry the ridge gourd skin adding salt until tender. Grind everything together along with coconut to a coarse paste. This thol thuvaiyal can be used as a side dish for roti, paratha also but best with hot rice. You can prepare this with the flesh of ridge gourd also. It stays food for 2-3 days in the refrigerator. Meet you all with more interesting recipes, until then it is bye from Padhu of Padhuskitchen. Hey I have a problem with leaving comments in your blog..I guess because of the light color of your blog templae, or something else,I am not able to see the "word" given for verification, so unable to leave the comment. I just happened to try a workaround, so I hope you might be able to see this comment. Kindly check it, because even other bloggers may be facing the same issue, not able to leave comments!! I will definitely look into the matter Rohini. Padhu, Would you mind if a share another variation of this recipe? You may publish if its okay. We fry the skin of peerkankai in little ghee. In the same pan we fry 2 tea spoon of fresh grated coconut for about 2 minutes, then 1/2 spoon jeera separately in little ghee. After the above ingredients cool, we grind it all tother with little tamarind and salt and very little water into a semi solid chutney. This is the way my mother prepares it. Goes well with rice, chapati and dosa. Padhu no idea to clean this ridge gourd.. Can u show me exactly which part we need to use for this chutney.. Please if u can put photographs..
Radha -Using a peeler, just scrap the skin first. Then with a knife, peel the skin and use that skin for this thuvaiyal.It is rich in fiber. You can use the flesh to make Ridge gourd dal. If possible, I will post the picture of the chopped skin. Ms.Padhu can we make this chutney with skin n flesh together? Have you ever tried like that? Please suggest. Your writings help a lot many forced bachelors like me and youngsters all over the world especially Tamil vegetarians. Congrats to you for the wonderful act of sharing your knowledge n experience. God bless you. Thank you so much.Glad you found the recipes useful. Regarding your doubt - you can make chutney with a mix of skin and flesh also. I do not peel the skin of ridge gourd fully.It tastes good. I dint add pepper and tur dal so my chutney was isn't tat good .. Is der any method to make the chutney spicy after grinding ? I tried this. Super taste.